Welcome to the first edition of The Educator Insider! As partners in music education for area youth, we hope you will enjoy and find useful this brief newsletter designed to keep you informed of programming provided by Madison Youth Choirs as well as provide a peek inside our educational process. We're grateful for the opportunity to broaden our connections with area music educators who share our passion for the art of teaching young people! In fall 2009, MYC staff discussed ways we could reach more singers in our community: How could we do more than just serve the kids that see us at weekly rehearsals? 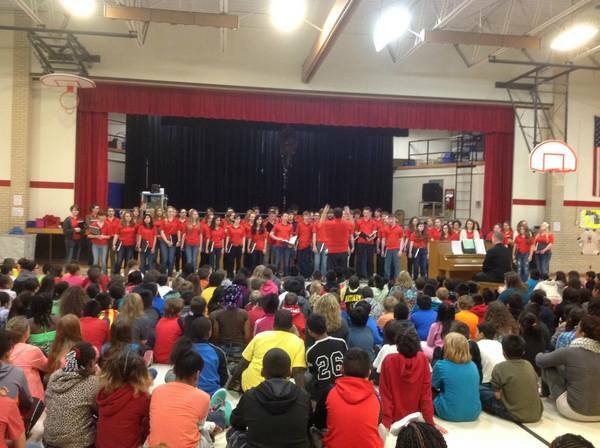 How can we have a positive impact in creating a strong culture of singing in Dane County? 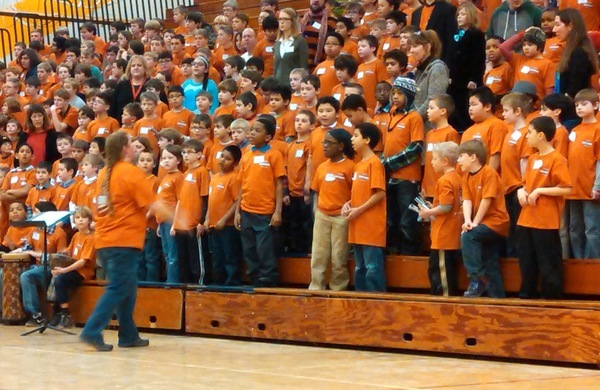 A few months later, in February 2010, the Madison Boychoir Festival was created to increase access to the arts and positively impact the singing culture of boys in Madison. The first year of the festival welcomed almost 250 participants; this year we will welcome nearly 500 participants who will be inspired as they join together to celebrate male singing voices in a warm and supportive environment. We invite everyone to attend the culminating festival concert, which is free and open to the public. We look forward to seeing many of you there! Designed to meet the needs of both beginning and experienced musicians ages 7-10, our introductory choir sessions provide our youngest singers the opportunity to attend ten weekly classes learning vocal technique, music theory, and rehearsal skills all in a highly active and engaging educational environment. That is all to say that our introductory choir program is for ALL students. It's not a place solely for the most experienced, most engaged, most "talented" young singers. We strive to use music as a pathway to positive self-expression and feel strongly that the benefits of singing in a choir reach far beyond the classroom and the concert hall. Our winter sessions of introductory choir begin on February 13 and registration is open on our website under the Join a Choir tab. Students with financial need are supported through our scholarship program and are encouraged to complete the tuition assistance application at the time of registration. Many of you already know about our spring outreach tours. These tours are offered at no cost to the hosting school and are designed to be engaging for all ages. Tours take place the week of April 25-29, 2016. 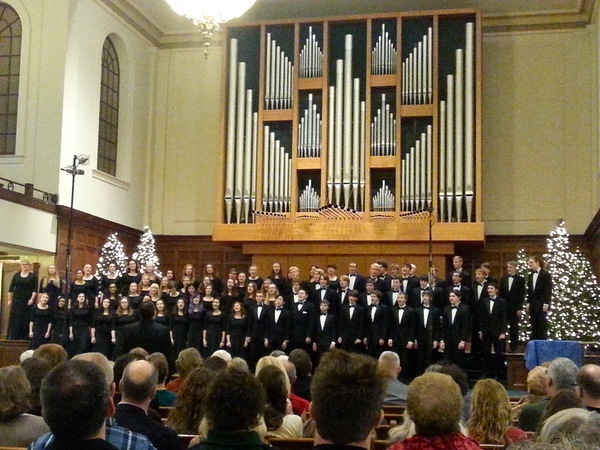 With just a few tour slots remaining, please let us know as soon as possible if you're interested in hosting a performance by contacting our tour coordinator Lisa Kjentvet at lkjentvet@madisonyouthchoirs.org. How is the work of a scientist like the work of a musician? MYC singers discovered connections between scientific and musical inquiry, using the tools of observation, experimentation, and analysis to reach a deeper understanding of our diverse choral repertoire. Along the way, they learned from several world-class scientists who served as our guest artists, both in-person and through our science and music video series. So how did we incorporate the theme in our rehearsals? The possibilities were endless and each conductor and choir put their own spin on it. Our youngest girlchoir, Choraliers, conducted a water displacement experiment to demonstrate the scientific idea that matter takes up space, much like rests take up time in music. They applied these ideas to the piece The Tailor of Gloucester, arranged by Cyndee Giebler, in which the subsequent verses displace the word “feedle” by increasing increments. Several choirs discovered entire pieces (Rattlesnake Skipping Song and Suo Gan) based on a simple motif. They uncovered how a motif is the seed or "DNA" of the entire piece, a fascinating study not only of compositional craft, but of how a piece is made coherent by musical genetic material. A vivid imagination drives our creativity and plays an important role not only in scientific advances but in developing expressive musicianship as well. We saw this musicianship in action at our December concerts as our wonderful young singers sang with a deeper connection to the music. Discounted tickets for teachers will be available. Check out our website for more concerts and collaborations.